2010 marks the 15th year for the Epcot International Food & Wine Festival. The theme for this year's Festival is "Celebrating 15 Years of Delicious Discoveries." Each year for 6 weeks Epcot is transformed into a world of culinary delights and enticing libations. For the 15th Annual Epcot International Food & Wine Festival the folks at Disney have added new features and brought back many of the old favorites to make this Festival one of the best ever. Starting on October 1st and running through November 14th, the schedule of events is jam packed and sure to please all who are able to attend this incredible event. You can download the Official 2010 Epcot International Food & Wine Festival Guide. This is the same guide that you will get when you visit the Food & Wine Festival in person. You can see the full schedule of events for each day of the festival, as well as, details about all of the various events. It is highly recommended to check this out if you are considering visiting the Food & Wine Festival this year. You can also look at the Official 2010 Epcot Food & Wine Festival Map. This map shows the location of all of the Countries and Regions represented around the World Showcase at Epcot and other Festival Event locations. There are many events that take place during teh Epcot International Food & Wine Festival. Here are a list of teh most popular features and events. Also keep in mind that all of the normal rides, attractions, and shows will be happening at Epcot during the Festival as well. More than 25 international marketplace kiosks are serving up tapas-sized portions of regional specialties. Explore countries on 6 continents through their most mouthwatering foods and beverages! Musical entertainment pairs perfectly with culinary fun during the nightly Eat to the Beat! Concert Series. Enjoy a varied lineup of classic rock, soul, R&B, jazz and funk hit-makers, from Boyz II Men to Rick Springfield! Each night brings 3 shows (5:15 pm, 6:30 pm, & 7:45 pm) at the America Gardens Theatre in Epcot's World Showcase. Learn from the masters with the Festival's exciting schedule of seminars and demonstrations featuring the fresh ingredients and secret techniques that go into some of the world's most extraordinary dishes and drinks. A special series of programs and experiences brings you renowned winemakers, guest chefs and speakers. Wine and beer tastings let you sip from the best in the world while delicious experiences such as the Party for the Senses dish up unforgettable tastes. The Festival Welcome Center hosts wine seminars and book signings and offers sparkling champagnes and wines at the Wonder Bar. 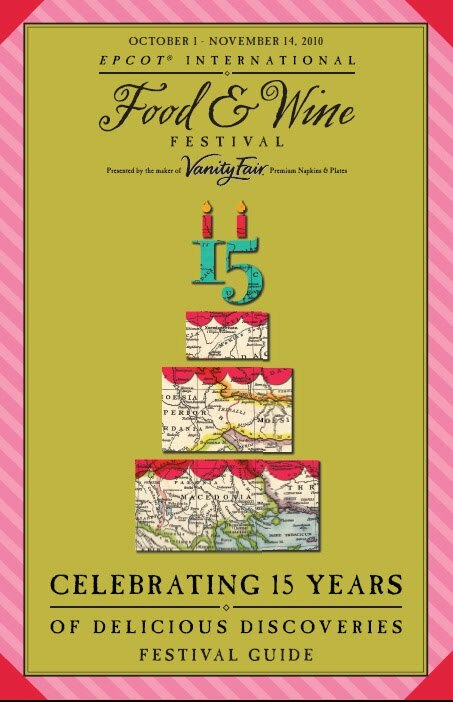 It's also the place to pick up Festival keepsakes, including limited edition Festival pins and cookbooks. And while you're there, be sure to check out the lists of famous personalities who will be appearing plus the times of their scheduled signings. Before and after the Epcot International Food & Wine Festival, you can find merchandise that celebrates the 14th annual Food & Wine Festival. While you're in the park, visit the Festival Welcome Center, which offers commemorative gifts, specialty kitchen items, a book shop and a wine bar. You can also visit the shops located around World Showcase Promenade for additional Festival merchandise offerings and artisans. Run Around The Parks, Dine Around The World. While you're here, join us for the Inaugural Disney Wine & Dine Half Marathon, which will be run on a brand new half marathon course at the Walt Disney World Resort, at night! Race under the stars through Walt Disney World Theme Parks, and enjoy a private after party at the Epcot International Food & Wine Festival exclusively for runners and their friends! Plus enjoy a full slate of weekend fun. Saturday, October 2, 2010 at 10:00 p.m.
0 comments to "2010 Epcot International Food & Wine Festival - Celebrating 15 Years Of Delicious Discoveries"